In a bid to ensure that Nollywood/Ghallywood and other African enthusiasts all over the world are given the best, the British Film Institute (BFI) and Nollywood Entertainment Limited UK, the Nigerian Television Authority and the Nigerian Film and Video Censors Board have finalised agreements to conduct a professional youth training programme in November at the British Film Institute in London, November, 2014. 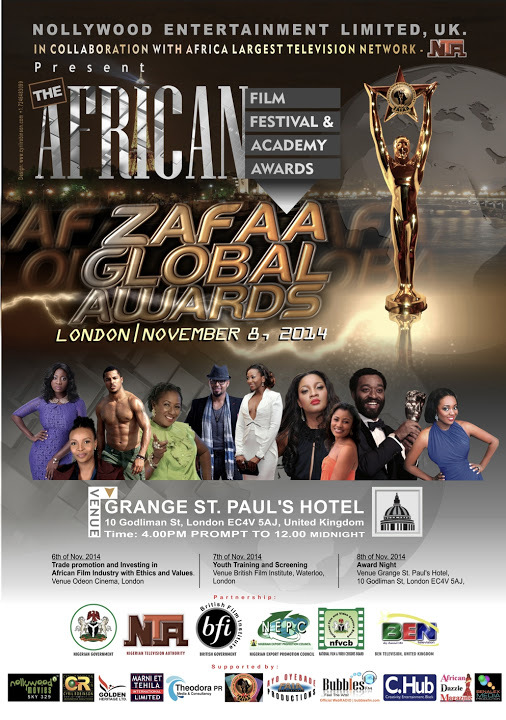 President of The African Film Festival and Academy Awards (ZAFAA), who confirmed this in a statement after meeting with officials of the BFI in London disclosed that the training targeted at youths is scheduled alongside the 2014 ZAFAA Global Awards from November 7 – 8. Anwuzia disclosed that ‘’with the professional training at the BFI more stars will emerge in the near future thereby giving the established stars a good run for their money. new phase aimed at continuous promotion of African arts and culture by telling her stories with pictures, established actors, aspiring actresses’, producers and aspiring youths will be taken through the rudiments of the industry during the programme. Interested members of the industry and youths who wants to be part of the training are advised to visit the ZAFAA website and follow the link to fill the form and pay for the programme. British Film Institute has already confirmed the screening of all the entries for this year’s award since the closure of entries for the different categories in June. After complaints that African films shot, recorded and produced outside the shores of the continent are not given adequate credit and recognition, ZAFAA has classified this year’s awards into different categories: home, away and diaspora. After series of meetings to harmonise the events, the ZAFAA officials in London and Nigeria, explained that it is more sensible to classify Nollywood and other African Countries in one category for the indigenous and one for the Africans in diaspora. The organisers said ‘’although there are some of the movies with known faces from home , we concluded that to be fair and also encourage the aspiring stars in the United Kingdom other European countries and the Americas, it would be appropriate to categorise and equally recognise and give them their right of place .